I have to admit, I never thought I would reach a point in my life where I was using a book written by Madonna to introduce and teach morality issues to my four year old, let alone to a classroom of students. But I have to say this book has quite a powerful message for young readers. 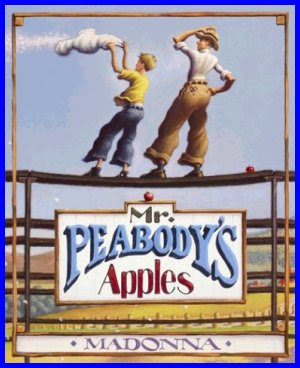 Mr. Peabody's Apples takes place in a tiny American town. The big-hearted and much beloved Mr. Peabody, is an elementary school teacher and Little League coach who dedicates his summer Saturdays to the local team. They just happen to be a losing team The kindhearted teacher seems to savor life the way he savors his weekly apple. He enjoys taking pleasure in the little things. One weekend after the game, Tommy Tittlebottom watches Mr. Peabody take his apple without paying for it. He begins spreading the rumor that Mr. Peabody had taken the apple. By the next Saturday, Mr. Peabody's apparent theft has become a wide spreading gossip throughout Happville. As a result no one comes to his Little League practice. A simple explanation puts the rumors to rest, but as Mr. Peabody points out in a powerful demonstration, small talk can often lead to big trouble for everyone. As adults it is so easy to be sucked in to gossip and rumors. We often find hearsay running rampant through our social circles, workplaces and even the local grocery store. Sometimes it is hard to escape. As moms and teachers we know how hurtful gossip can be (especially in the teen years) and how important it is to teach our little ones to take the moral high ground and do the right thing. However we can talk till we are blue in the face, our children follow our lead. When we are on the phone or at soccer practice gossiping about the latest news our children are picking up our bad habits. Bad habits don't pop up over night, our children watch and learn from us over time and sometimes are the biggest mirrors to our own behaviors. So take a lesson from Mr. Peabody's Apples and think before you speak, your children both at home and in the classroom will follow your example. To help my little one with the story we took some time out while we were at the beach to have a little teachable moment. We had just read the story the night before, so I asked my daughter if she could just pick up one piece of sand. She thought for a moment and got her shovel. I told her no I just want one piece. After trying for a few minutes she finally told me mommy I can't it's just too hard. I related the story to her challenge of only picking up one piece of sand. By relating the story from the book to her experience it helped to convey the message. While she might not fully grasp gossiping she does understand telling the truth and telling a lie, which at 4 years old is an important skill to teach frequently. I used this story and activity to reinforce our conversations on telling the truth. Quite frequently I catch my sweet little 4 year old blaming things on her sweet baby brother. Helping her to realize the importance of always being honest is a great life skill that she will need, especially as she heads off to school. So when you have a behavior or situation you need to address with your little one. Look to a book to help you illustrate your point!